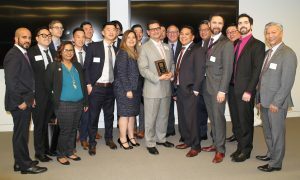 Upon receiving the Asian Pacific American Bar Association’s (APABA) Trailblazer-in-the Law Award, LA County Public Defender Ricardo García spoke of his pride at being the first Latino top attorney in the nation’s oldest and largest public defender’s office. Public Defender Ricardo García receives his APABA Trailblazer-in-the-Law Award from APABA board member Jane Tanimura.He was surprised to learn there had been no Latino public defenders before him, and expressed dismay that no woman public defender had ever been appointed. 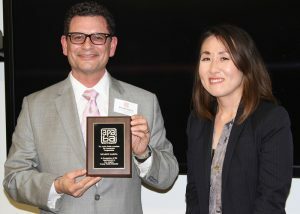 “It is an honor but I think I would also have been as honored if I had been the public defender after women public defenders,” García told a group at APABA’s awards ceremony held Feb. 7 at Reed Smith’s downtown office, where he took time to commend Alternate Public Defender Janice Fukai in the audience. Born in Los Angeles to immigrant parents from Mexico and the first-generation college graduate in his family, García said that his position was an important lesson for his two young sons. He wants to be an example, for not only other Latinos. Ricardo García is flanked by PD attorneys celebrating the event. “I get to come to an office with such a rich history,” he said of the LA County Public Defender’s Office, in existence for 100-plus years. “I get to work with men and women who have been breathing this career in an office that has been living and breathing this practice long before being a public defender was something our Constitution recognized. Others honored at the ceremony were Kevin Brazile, Presiding Judge, Los Angeles Superior Court; Anne Hwang, Chief Deputy Federal Public Defender, recently Appointed Judge of the Los Angeles Superior Court; and Jason Lee, Chair of the California State Bar Board of Trustees. For questions, contact the Public Defender’s office in your area. Click “Contact” at the top right to find the telephone number and address for your local office. Copyright © 2019 Los Angeles County Public Defender’s Office. All Rights Reserved. The materials available on this website are informational only and not for the purpose of providing legal advice. You should contact your attorney to obtain advice with respect to any particular issue or problem. 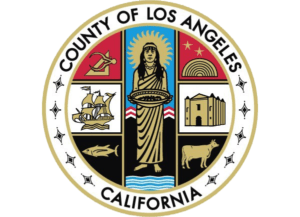 Use of and access to this website or any of the email links contained within the site do not create an attorney-client relationship between the Los Angeles County Public Defender and the user or browser. The opinions expressed on this site are of the individual author and may not reflect the opinions of the department or any individual attorney.